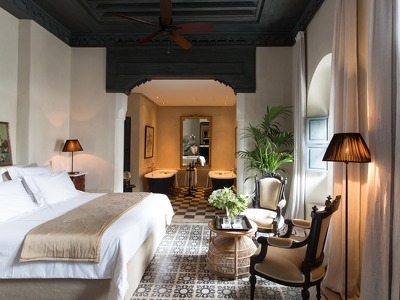 Riad de Tarabel has 10 air-conditioned rooms and suites filled with antiques, family furniture and photos. Each has a French colonial feel, allowing you to drift back to bygone ages. Tiled floors, open fireplaces, rolltop baths, French table linen, crisp sheets and sweet-smelling fresh roses are some of the features in the rooms. One of the bedrooms has two rolltop baths, making it the perfect choice for friends or couples. Whichever room you choose, you can take advantage of a local mobile phone along with a daily delivery of home-made Moroccan pastries, mint tea and soft drinks. These lovely rooms are cosy and chic, with open-plan bathrooms complete with sophisticated clawfoot bathtubs. Decorated in a French style, antique furnishings combine with traditional tiles and fine linens to create a truly luxurious ambience. Twin beds are also available. This beautiful bedroom features its own working fireplace which is lit during the cooler evenings. The cosy atmosphere is heightened by the open-plan bathroom, which boasts a clawfoot bathtub. In keeping with the rest of the hotel, the room has a French style, decked with antique furnishings and white linens. Twin beds are also available. Featuring its own working fireplace, which is lit during the cooler evenings, this suite is the epitome of luxury. It has a French style, which is echoed in the antique heirloom furniture. The bathroom is open-plan and the suite has two bathtubs, as well as a shower. Spacious and airy, the room is located on the ground floor. Twin beds are also available. 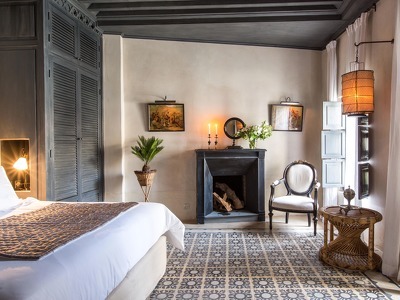 This Suite is decadently furnished in the French style of the riad, with antique heirloom furniture, white linens and traditional tiles. The bedroom opens onto the bathroom, which has a beautiful clawfoot bath and a double shower. The bedroom features its own working fireplace, which is lit during the cooler evenings. There is also a separate lounge area. Twin beds are also available. Riad de Tarabel is a luxury riad nestled in one of the oldest and most beautiful districts of the Marrakech Medina, near the Dar El Bacha Palace. Unlike many of the riads in Marrakech, Tarabel's owners Rose and Leonard opted for an elegant mix of French and Arabic styles for the interiors with furnishings sourced from all over the world including pieces from Leonard's parents' own château back in France. Hand-made wallpapers and bespoke details make for a decidedly luxurious feel and the service is unfailingly attentive and professional. With its sun-kissed terraces, hidden corners and tree-lined courtyards - this stunning and serene hideaway is the perfect spot for those after a more refined riad experience. The pool is a wonderful place to relax on a warm afternoon and dinner served up on the terrace with views out over the Medina is a must. The Riad de Tarabel is adults-only (guests over the age of 16). Really we built it as a house for us in the beginning but then we had a lot of people wanting to stay, so we decided to turn it into a hotel. We now have 10 rooms but we won’t make it bigger because the soul of the house would change and the atmosphere would change. We wanted to create a very peaceful atmosphere. With it being only 10 rooms, you don’t realise there are other people in the riad – it’s like having your own home in Marrakech. The décor is a real mixture – with the Moroccan architecture but then art and furniture from all over the world. Our decoration is the real difference between us and the 900 other riads in Marrakech – CNN came and said that we were one of the top riads here. Marrakech is great for a 3-night dash or a week long stay. Shop until you drop in the souks or head to the new town of Gueliz, where you'll be spoilt for choice on great interior and leather shops. The Red City is an incredible place to pass an afternoon or spend a few hours at Yves Saint Laurent's Jardin Majorelle. If you are staying longer than 3 nights, we'd recommend heading out of the city on a day trip to the Atlas Mountains. For a spot of relaxation, spend a day by the swimming pool or cool off in the roof-top plunge pool. Massages and beauty treatments are also available and you can hone your cooking skills with one of Tarabel's cookery courses. General manager Laurent and his excellent staff are also more than happy to organise treks, leisure activities or events. Imagine an elegant and exclusive restaurant in Paris; that is how you'll feel dining at Riad de Tarabel. Whilst there's no official restaurant per se, the charming staff will set you up a table wherever you choose. Whether by candlelight in a quiet corner of the courtyard or up on the terrace with views out over the Medina - you'll enjoy the chef's wonderful mix of French and Moroccan cuisine. Just be sure to arrive with an appetite – the meals are abundant! Alcohol is also served in the riad (not a given in the Medina) and the staff will happily bring you your tipple of choice. Breakfast is absolutely delicious. Sample Moroccan specialities, including divine pancakes and a range of fresh pastries, muesli, home-made yoghurts, cakes, cooked-to-order eggs, fruits and juices. Riad de Tarabel has 10 air-conditioned rooms and suites filled with antiques, family furniture and photos. Each has a French colonial feel, allowing you to drift back to bygone ages. Tiled floors, open fireplaces, rolltop baths, French table linen, crisp sheets and sweet-smelling fresh roses are some of the features in the rooms. One of the bedrooms has two rolltop baths, making it the perfect choice for friends or couples. Whichever room you choose, you can take advantage of a local mobile phone along with a daily delivery of home-made Moroccan pastries, mint tea and soft drinks. My husband and I just had an incredible 4-day stay at Riad de Tarabel. The aesthetics, the standard of service, the attention to detail were all top notch. It made our first Marrakech trip a fantastic one. Many thanks to Laurent & his entire team. Amazing! I can't recommend this Riad enough. Laurent and his team took great care of us, the Riad is beautiful and all the staff is super attentive. We had dinner in the Riad the first nice and it was wonderful. 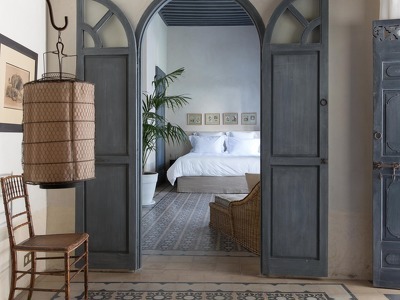 This must be the nicest Riad in all of Marrakesh. Not because of the beautiful rooms, the luxurious bathtubs, the pristine garden, lovely sitting areas sprinkled on every floor. It's not even the rooftop beds and sunbathing lounge chairs or the nice swimming pool. What really makes this the most enjoyable Riad is the unrivaled customer service and that stemmed from the top down. The manager went above and beyond with helping us with transportation, making purchases, giving us a complimentary cell phone during our stay and even with packing the rugs we bought in the souk.